Jason Tuenge (left), IES Standards Committee's Lighting Practice Advisory Panel Chair, has also contributed to draft standards developed by the ANSI C136 Roadway and Area Lighting Committee, and his ongoing research into Power over Ethernet (PoE) lighting systems has led him to engage with the ANSI C137 Lighting Systems Committee and the IEEE P802.3bt Task Force. Bruce Kinzey (right), IES's Sky Glow Calculations Committee Chair, also currently serves as Director of the DOE Municipal Solid-State Street Lighting Consortium, a collaborative effort among more than 400 street and area lighting partners to develop and share information and tools related to implementation of high-performance LED lighting. Advances in solid-state lighting and associated controls have the potential to reduce lighting energy usage in the United States by about 75 percent. 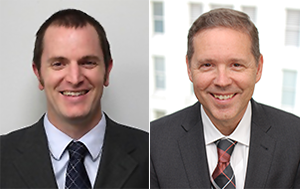 Key to achieving that potential are Jason Tuenge and Bruce Kinzey, two senior research engineers at PNNL who recently began serving terms on Illuminating Engineering Society (IES) standards committees. Tuenge is serving a three-year term as chair of the IES Standards Committee’s Lighting Practice Advisory Panel. Kinzey is serving as chair of IES's Sky Glow Calculations Committee (SGCC). The American National Standards Institute (ANSI)-accredited IES must follow ANSI's Essential Requirements for arriving at consensus-based standards. The Standards Committee is responsible for overseeing the process by which IES Standards are developed. It consists of six at-large members plus three Advisory Panel Chairs, accompanied by two liaisons to the IES Board of Directors. As a panel chair, Tuenge will be overseeing the following technical committees: Electrical Engineering for Lighting Systems, Light Sources, Light Control & Luminaire Design, Control Protocols, Economics, Energy Efficiency Lighting Programs, Energy Management, Commissioning, Maintenance, Sustainability, Resilience, and International Standards. The SGCC, chaired by Kinzey, comprises about a dozen lighting researchers, modelers, and astronomers. Collectively, they represent a wide range of backgrounds and interests related to the presence of human-sourced light in the night sky. The SGCC is developing recommendations for estimating and measuring the contribution of exterior lighting sources to increases in night sky brightness, or sky glow. PNNL’s related ground-breaking study, An Investigation of LED Street Lighting's Impact on Sky Glow, examines the expected contributions to sky glow from converting high-pressure sodium street lighting to broader-spectrum (i.e., white light) sources, with specific focus on LEDs. The U.S. Department of Energy and PNNL are interested in sky glow because PNNL research has shown that energy-efficient light-emitting diode (LED)-based street lighting systems save substantial amounts of energy and also significantly reduce contributions to sky glow in most typical conversion scenarios. The committee is tasked with producing recommended calculation methodologies for estimating sky glow impacts, and associated tools for use by the general lighting community. For more information on IES, visit their Technical Committee and Standards Committee webpages.